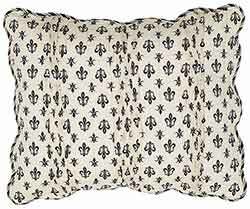 Go for a French-Country look with the Elysee Quilt Colection, featuring black fleur de lis on creme in the center complete with ruching giving it a gathered effect. Colors are black, grey and creme and the quilt is trimmed with a scalloped edge for a timeless look. 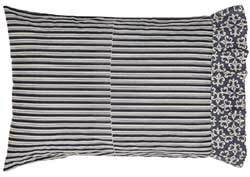 Elysee Pillow Cases, by Ashton & Willow. We are offering bedding accessories on a special order basis for those interested in adding on to their quilt purchase. 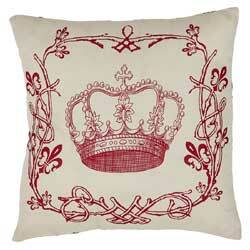 This is for the Elysee Pillow Cases, designed to coordinate with the Elysee Quilt. Sold in sets of TWO. Measures 21 x 30 inches. 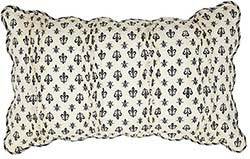 Feature a crème and black ticking stripe with a crème fleur de lis on a crème ground. 100% cotton. SPECIAL ORDER ONLY.